Are Estée Lauder and Dior foundations harmful? A good foundation is key to a good makeup look so let’s check if this beauty product deserves a place in your cosmetic bag. The roots of makeup foundation go far in the past: from Ancient Romans who used chalk and creams to lighten their skin, to women in Italian Renaissance who would put water-soluble paint on their face. Unfortunately, these people used ingredients which are very harmful to their skin with the purpose of looking prettier. Nowadays, so many young girls around the world have that same goal and they are trying to cover their imperfections with makeup. As this beauty product is usually applied first and is an inevitable process of the makeover, I have gathered some information on what really makes a good foundation and whether the ingredients in it are safe for our health or not. However, before you continue reading, make sure to find out what moisturizer to use, which will help your skin glow. Before applying the makeup, always make sure to do a good skincare routine! If you have dry skin, foundations which contain avocado, sesame or jojoba oil will help moisturize your skin. Check out for products which contain glycerides, as they are also good for it. The foundations which contain benzoyl peroxide fight blemishes, while zinc oxide can be used as a protection from the sun. If you are having issues with acne, try to find products containing Vitamin A, while the ones with Vitamin E helps protect the skin from the environment. I know, this is a big bunch of difficult words, but try to memorize at least some of them, and you are good for the beginning! I have found this website where you can check all the ingredients a certain makeup product contain and check how good or bad they are for your skin. This website is super useful and important, and it definitely deserves a place in your bookmarks! I am guessing that most of us don’t really check which ingredients our foundation contains, which actually is a bit irresponsible! Anyways, that is why I am here for you girls, with reviews of 2 of my favorite foundations, the ESTÉE LAUDER Double Wear Stay in Place and the Dior Backstage Body and Face Foundation. I used these foundations for years but was really shocked when I found out that one of these contains really harmful ingredients! Continue reading if you want to know which product disappointed me! Even though I am probably one of the biggest fans of Estee Lauder, I have noticed that their new formula contains minimal oil control, making oily skin look shiny. Polyglyceryl-3 Diisostearate: a chemical which is bad for people with oily skin, more precisely it will make their skin look even more oily, therefore this product definitely is not for them. Butylene Glycol: It, however, contains another ingredient called l which is good for dry skin, which explained why it fit me so well. Phenoxyethanol: Unfortunately, I was a bit sad when I found out that the ESTÉE LAUDER Double Wear Stay in Place contains Phenoxyethanol, which is a very bad chemical as it can cause skin and lung irritation. Luckily, this was the only harmful ingredient, and you can check the full list of the ingredients found in ESTÉE LAUDER Double Wear Stay in Place here. This was my other favorite foundation from Dior before I did some research about it. You can find the foundation here at Sephora. Compared to the ESTÉE LAUDER Double Wear Stay in Place, you can purchase this foundation for $40.00 which is a bit more affordable. This foundation is waterproof and I use it if I know it is going to rain, or if I have my Pilates lesson after work and don’t have time to remove my makeup. Even though I rarely wear any foundation during warm summer days, Dior was my choice for high temperatures as it stays on my face in extreme temperatures and humid environments. I have chosen the 3W- 3 warm shade for light-medium skin with warm yellow undertones. My skin does actually not have yellow undertones, but I like to make it seem a bit warmer. This Dior foundation actually reminds me a bit of the Fenty Soft Matte Longwear Foundation which also has these sorts of tones. However, once I started reading a bit more about Dior, I came across some facts which really made me change my mind about the brand. One of the biggest reasons why I would always go for Estee Lauder instead of Dior is that Dior tests their products on animals, which I did not know before and am definitely not a fan of this. I am aware that a lot of other cosmetic brands do that, but I did not really expect this and feel quite guilty of purchasing their products. Linalool: it is usually used by pest professionals as a flea, fruit fly, and cockroach insecticide. It can also be used a method of pest control for codling moths. Limonene: even though it has some antioxidant benefits and calms your skin, limonene’s penetration enhancing effects make your skin more prone to the entrance of alcohol, which is bad for your skin. It is usually used to give a fragrance to the product. Fragrance: it is always better to look out for fragrance-free products, no matter how difficult that can be! Fragrance ingredients may be derived from petroleum or natural raw material, so such products should be avoided! 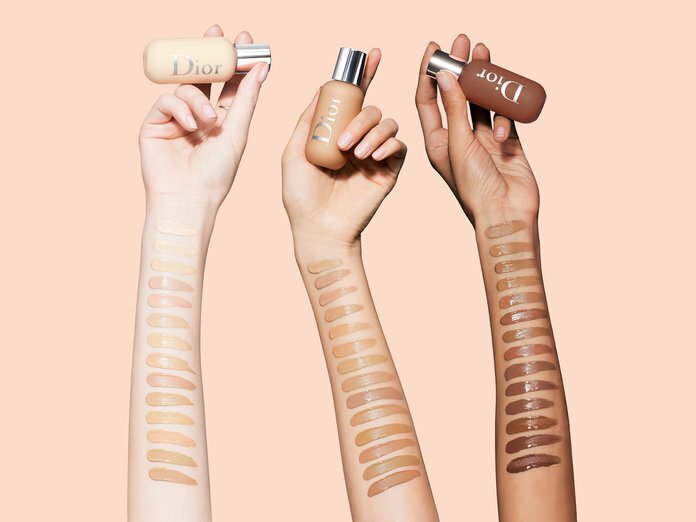 Check out the full list of the Dior Backstage Body and Face Foundation here! No matter how popular a brand can be, I hope you understand now that you always need to be careful girls! The packaging can look awesome, the foundation can smell and feel great and can be the most talked-about product, but that does not mean it is completely safe to use. As I said, I have been using these two foundations for so long, but I was really disappointed when I saw how many bad chemicals the Dior Backstage Body and FaceFoundation contains. Compared to it, the ESTÉE LAUDER Double Wear Stay in Place had a better formula and is safer to use. After all, I should not be so surprised as the sole purpose of all these cosmetic brands is to sell as much as they can, and it seems that our well-being is not always their first concern. If you want to know more about safe cosmetics, check out this article and let me know what you think about this topic in the section below! Mary R : Couldn't agree more! Can't say that I strictly stopped using products from companies with the characteristics you mentioned, but I really try to replace my beauty routine with eco friendly and natural cosmetics. Glad you spread the awareness!